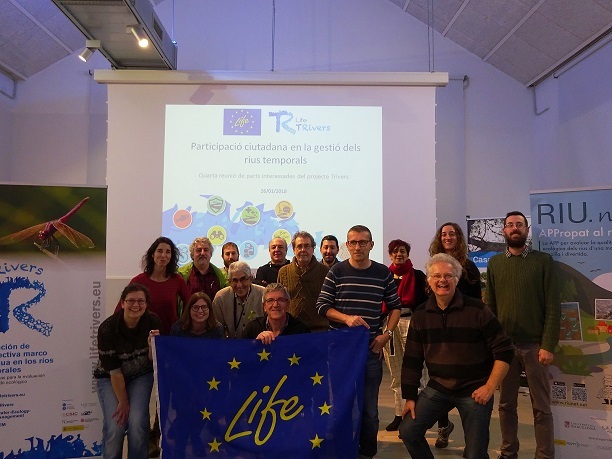 On January 26, Casa de l’Aigua (Barcelona) held the fourth meeting for the European project called LIFE TRivers , which is coordinated by the UB. Several stakeholders and experts involved in temporary rivers –described as waterways that stop flowing on a regular basis and can even dry up─ took part in the session. 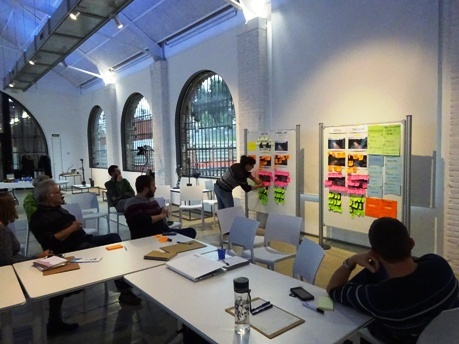 La Casa de l’Aigua (Barcelona) held the european project LIFE TRivers fourth meeting. 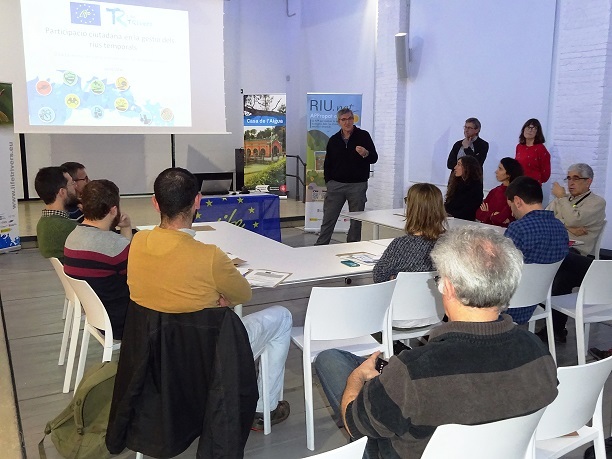 The main aim of the meeting was to share the social actions of this project, which gathers managers, scientists, entities and mainly citizens who are interested in river management. These actions favoured the incorporation of people’s knowledge on the hydrological status of rivers through surveys and data collected by the RiuNet app. These data favoured the classification of the corresponding rivers and enabled managers to retake their sampling routines. The session also provided a presentation on the process of citizen participation that took part during the last months, aiming to improve the diagnosis of the status of temporary rivers and submit measures in order to preserve them. The European project, called LIFE TRivers, is coordinated by Narcís Prat, director of the Freshwater Ecology and Management research group (FEM), of the Water Research Institute (IdRA) of the UB, and in which the following take part: Institute of Environmental Assessment and Water Research (IDAEA-CSIC), the Catalan Water Agency (ACA) and Jucar Hydrographic Confederation (CHJ). Its aim is to bring solutions to make a proper diagnosis of the ecological status of temporary rivers, and improve its management in accordance with the aims of the European Union Water Framework Directive (DMA). The main aim of the meeting was to share the social actions of this project. “The first problem in this management is the lack of knowledge of the river regime, since, for instance, gaging stations are placed only in permanent rivers. Moreover, common data give information on whether the water flows or not, but we don’t get data on the presence of ponds–which are very important to the aquatic life- when a river stops flowing”, says Francesc Gallart, IDAEA-CSIC researcher. According to data by the ACA, this lack of information resulted in a lack of data on the status of about 8 % of waterways in Catalonia so far. In order to solve this problem, TRivers created the TREHS software (Temporary Rivers Ecological and Hydrological Status), whose main aim was to help in the diagnosis of the ecological status of temporary rivers. TREHS brings the available historical data on each river flow, as well as data from simulations that were made out of water runoff models and additional data from aerial photographs and certain observations from biological samplings. Furthermore, LIFE TRivers also added citizen knowledge on the hydrological status of temporary rivers by making surveys around the neighbourhoods. “Scientists are not the only ones with useful information, neighbours can provide useful knowledge on the water regime to improve its management, and this information can fill the voids in our instrumental data. This is an empowering methodology”, says Francesc Gallart. The information provided by the new software enabled researchers to obtain data from where there was nothing, therefore helping to make a precise profile of the water regimen of rivers and to improve its classification. In fact, both ACA and CHJ have incorporated TREHS to their tools to know the water regimen of waterways. “Using TREHS enabled us to know more about the real water regime and list temporary waterways again, and with these data, we can retake sampling and evaluation routines”, says Carolina Solà, from the Department of Water Control and Quality in ACA. According to the data provided by ACA in the session, there was a lack of knowledge on the real regime accounting for a 38 % of the waterways in Catalonia ─before using TREHS. Thanks to the information this software provided, they can determine the real regime of those: 63 % with a permanent regime, 19 % temporary, 9 % sporadic and 9 % short-lived. The session put emphasis on the involvement of people through RiuNet, a citizen science app with a simple version of TREHS. This app allows people to assess the hydrological and ecological state of rivers by using their smartphones. The meeting ended with a workshop to reflect and debate on the social view of temporary rivers and the goods and services they provide us with. Núria Cid, member of the FEM group, notes that the information they obtained from RiuNet “has a great value, since it can fill up the information gathered by the administration, which controls the ecological quality of rivers, but only in certain places and time”. With people’s information, “we can improve the knowledge of the ecological status of rivers in areas where water administration does not regularly assess, or we can make such evaluation during a different time than when they undergo the monitoring protocol”. Also, “environmental problems or improvements can be detected after having used some management measure”, adds Núria Cid, who is also a post-doctoral researcher from the Department of Evolutionary Biology, Ecology and Environmental Sciences of the University of Barcelona. Last, the session presented some of the data taken from the citizen participation process, which took place over the last months, and whose aim was to raise awareness on temporary rivers, make a proper diagnosis and a proposal for management measures, regarding both its current status and its future preservation. “This process is important because it gets knowledge from locals, it helps searching for solutions, promotes interest in the preservation of temporary rivers and it contributes to their assessment”, says Alba Ballester, expert on citizen participation processes and water management, who coordinated this initiative. The results of the latter and the proposals on measures will be presented in the final meeting of the project, to be held in Barcelona on May 3 and 4. The meeting ended with a workshop coordinated by Alba Ballester and Dídac Jordà, from the Catalan Institute for Water Research (ICRA), to reflect and debate on the social view of temporary rivers and the goods and services they provide us with. This workshop had the participation of representatives from the attending entities, such as the Collserola Natural Park Consortium, the Center for the Study of Mediterranean Rivers – Uvic, Barcelona Council, Lavola, the Center for the Study of Mediterranean Rivers, Cel Rogent Environmental Education, Centro de la Playa, Museu de les Mines de Cercs, Vinculos Foundation, the Natural Science Museum of Granollers and the GEPEC Countryside Ecosystem Study Protection Group.